Not a lot of people know about it that brewing a coffee properly matters a lot but what matters the most is the water that’s used to brew it. Yes, you read it right and it wouldn’t be wrong to say that the water affects the taste of the coffee to a whole another extent. It’s not the water actually that affects the taste, in fact, the ph level and the content of minerals in the water is what changes the taste. You might have the best and the most expensive coffee with you but if your water isn’t good, it can literally ruin the taste of your coffee which is something no one would ever want. We’ll put it straight for you, if your water tastes good when you drink it, it will probably be good for your coffee too. You can have the best Nespresso capsule but again, if you choose the wrong water, you will end up destroying your coffee. However, that’s not exactly what we are here to discuss, in fact, today the topic of our discussion is that does reverse osmosis water make better coffee or not? Well, for starters, yes, RO water makes the best coffee possible and we are now going to explain all of that to you in detail. 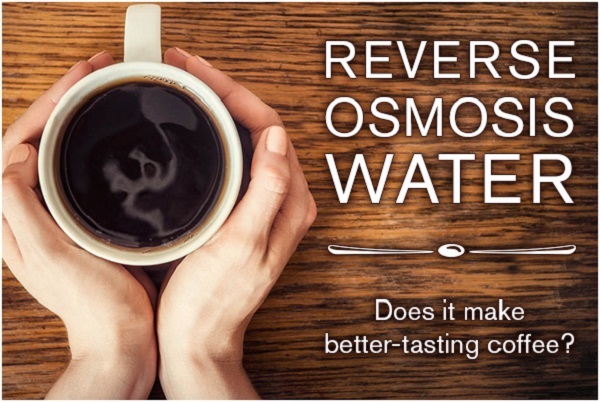 Reverse Osmosis Water And What Makes It Good For A Cup Of Coffee? First of all, let’s explain reverse osmosis to you in detail. You see RO is a process in which all the minerals from the water are removed and as far as the ph level if concerned, well, it reduces to a whole another level. In short, in the reverse osmosis process, you are just left with plain water that is free of minerals and has a very low ph level. Now, if you really want your coffee to taste good then we’d suggest you to get the best reverse osmosis system first and then pass your water from the RO process. You see the tap water usually comes with contaminants and then there are chlorine and other elements in it that will obviously affect the flavor of your coffee so the wiser thing to do is to use purified water that is free of fluorine, chlorine and other such minerals. Now, honestly, if you search the internet about RO being effective for better tasting coffee then we are pretty sure of the fact that you will easily get confused. Right now, a lot of people are debating on this topic and to some, mineral-free water ends up giving a flat taste to the cup of coffee which isn’t true because it doesn’t make any sense. It’s not even about the coffee, in fact, what would be the wiser thing to do? To drink the water from the tap that is contaminated or to drink the water that is passed from a reverse osmosis system and is purified? It’s common sense and as far as the alkalinity is concerned, well, a lot of people use additional filtration just to increase the alkalinity of the water and to balance the ph level. Also, let’s face it, there are just so many other elements too that decide the taste of a coffee. The fresh beans, the brewing, the method used to make the coffee etc, there’s just so much that decides what the coffee will taste like. On a serious note, if you want to drink a better tasting coffee that is healthy for you too then yes, you should opt for an RO water as it definitely works!